If you have a child that is interested in Astronomy, this would be a great gift idea! 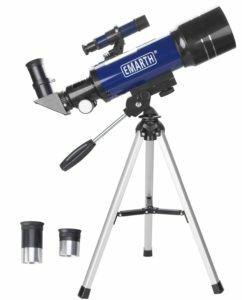 You can get the Emarth Astronomical Refracter Telescope for Kids for only $58.99! That is a NICE savings of 63% because this telescope is normally $159.98! The fully coated optical glass with high transmission coatings creates stunning images with increased brightness and clarity. The high-powered telescope also provides correctly-oriented images, making it an ideal choice for both terrestrial and celestial viewing. Make sure that you grab this deal soon on Amazon because the price can change at anytime! CLICK HERE TO ORDER Emarth Astronomical Refracter Telescope for Kids for only $58.99 today!